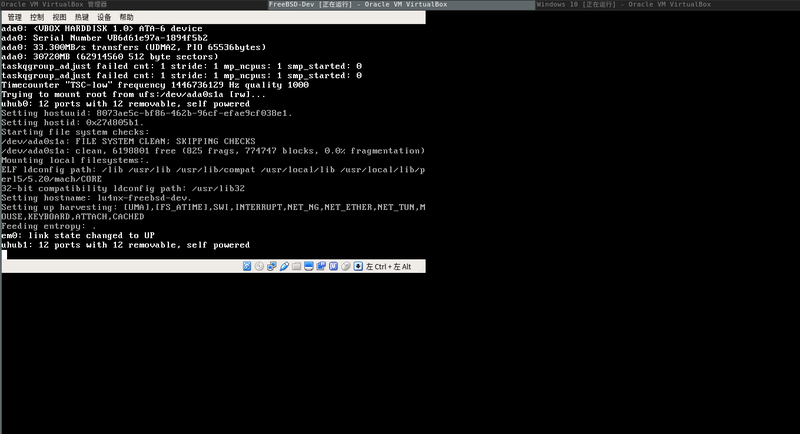 Virtualbox 5.0: Blackscreen in fullscreen mode with i3wm host. ISSUE: It seems that VirtualBox update don't handle the fullscreen mode when host is using i3wm as Window manager. When hitting host+F keys, the screen become black and the only way to go back is to click icon on the bottom bar (Host+F was not responding when in fullscreen mode). INVESTIGATION: The issue was not present on the last virtualbox update (4.3.24 on ArchLinux). To be sure that the problem came from the window manager, I launched virtualbox on the same machine using XFCE as window manager and everything was fine. I have tested it with multiple VMs: Slitaz, Debian 8, Windows server 2012, Windows 7. Each time with updated guest additions tools. screenshot_20161120_01.png (26.3 KB) - added by emak 2 years ago. VBox.log (396.5 KB) - added by emak 2 years ago. 2017-01-20 10-52-51屏幕截图.png (38.8 KB) - added by lu4nx 2 years ago. I'm afraid that I can't see us finding time to look at this in the near future. If you want this to move faster you might see if you can get the i3wm authors to take a look? If you open a bug ticket with them you could point us to it on this ticket in case any communication is needed. Does turning off the mini toolbar have any effect? It seems to be causing problems in 5.0. If I turn off the mini bar I can't exit the fullscreen mode. I will try to see with i3wm team but I think they will not fix issue caused by a third party application. You should be able to exit using the combination Host+F. Nop the shortcut don't work since my upgrade to virtualbox 5.0. Host+F work to enter fullscreen mode but not to exit. I realize this comment is a bit after-the-fact. I currently have the same problem reported here with i3 version 4.10.3 and VirtualBox 5.0.2. I can confirm that with the mini toolbar enabled, the Host+f shortcut will only work to start the fullscreen mode (which will show only a black screen), but it cannot leave fullscreen mode. I can confirm that disabling mini toolbar successfully works around the issue. The virtual desktop renders as intended, and the keyboard shortcut works to leave fullscreen mode. The menu can still be accessed with Host+Home, so this workaround isn't a problem for me. I'm not very hopeful, but some things have changed in the relevant code area, so you might want to give a current 5.0 test build<1> a try. hello, I've got the same issue in Ubuntu 15.04 in i3wm, using Virtualbox 5.0.10, 5.0.4. I've had the same issue in Debian 8, i3wm, virtualbox 5. Virtualbox was working before upgrade to v5. It's serious problem for me, and it's in stable realease. This happens to me as well but in reverse. On my Windows 7 desktop host (VirtualBox 5.0.10) full screen gets screwed up with a Debian i3wm VM. My Ubuntu 14 laptop on Unity as host (VirtualBox 5.0.10) doesn't screw up on full screen like the windows machine. Just out of interest, do the 3D settings in the virtual machine affect this? In the guest settings --> user interface --> Mini ToolBar checkboxes: I disabled the checkbox for 'Show in Full-screen/Seamless' and enabled the 'Show at Top of Screen'. After this I could resize, float the window with i3 commands and use Host + F to switch to fullscreen. My setup: Linux Mint as Host, debian as guest. Virtualbox Version is 5.0.12. Out of interest, is this still an issue with 5.0.16 and the updated Additions image on the Downloads page? Note that I am not aware of any special changes which would fix this. This regression is still present in 5.0.16_OSE r105871. I'm using Arch Linux 4.4.5 with i3wm version 4.12 with as host, and the issue is present in Windows, Linux, and BSD guests. Disabling the toolbar still works fine as a workaround. I notice that no one has attached a log file, or answered my question about whether 3D settings make a difference. I have to say that the chances of a team member looking at this soon are not very high. In particular, 3D in X11 guests is currently more or less user-supported (see the related wiki page). Generally of course, the more people find out about this the better the chances of seeing it fixed are. Please though, no more comments just to say that it is not fixed. I will remove those comments, as they tend to make tickets harder to follow, but add the user names to the Cc list so that those people get updated when the ticket is changed. I did just check the status of the ticket. I can confirm that it has to do with the mini bar. When I disable it for the VM I can use the Fullscreen mode, when I enable it, the VM goes black. The 2D and 3D mode had no visible effect nor changed the behaviour. Still this way in virtualbox 5.1.8-1 with virtualbox-guest-iso 5.1.8-1 and i3-wm 4.13-1. I just remember that at the same time that happened, there was an upgrade on Qt and I came here in first place, because my normal view mode (floating window, automatically resizing the VM's resolution to the window size) didn't work anymore after that upgrade (it started to always resize to a very little window and I was forced to use the fullscreen mode). I just attach the log from the last session when I reproduced the resizing error. Hope that helps, else just ask. At the moment I do not think that this is likely to be investigated by the VirtualBox team, as the team members who would be able to do so have too many higher priority issues which would prevent them from getting to it (and unfortunately I am not aware of any customer requests for better i3vwm support). Your best bets are either reporting this as a possible i3wm bug (in fact I suspect that it is not a true bug in either i3wm or in VirtualBox, more a disagreement over protocols which could be investigated from either end), or perhaps best of all investigating it yourself if you have the required programming skills. I notice that you are using the Arch build of VirtualBox, not ours. You might want to try our "all distributions" package which also includes a supported Qt version (we have not tested 5.7.0 at all). I don't expect this to make a difference though. By the way, anyone commenting here, please check whether you are seeing the original problem reported on this ticket or the problem described in ticket #15863. Added AaronPB to CC list.